Walter Simonson’s been a big favorite of mine, even since I first discovered his Manhunter series with Archie Goodwin back in my teens. 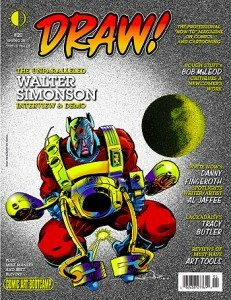 So naturally I’m pumped to present Mike Manley’s interview with him in Draw #20, due out April 20. The issue also features Danny Fingeroth interviewing writer/artist Al Jaffee (another fave of my formative years, reading MAD magazine), Bob McLeod critiquing a newcomer’s work, a demo by Tracy Butler of the strip “Lackadaisy”, plus Manley and Bret Blevins in another Comic Art Bootcamp installment. Check out the FREE PDF PREVIEW of the issue, or if you’re already sold on DRAW, you can order the issue HERE in either print (with free digital edition) or digital-only for a measly $2.95.